A Ticketmaster snafu last week probably spoiled the surprise, but it wasn’t much of a surprise anyway. 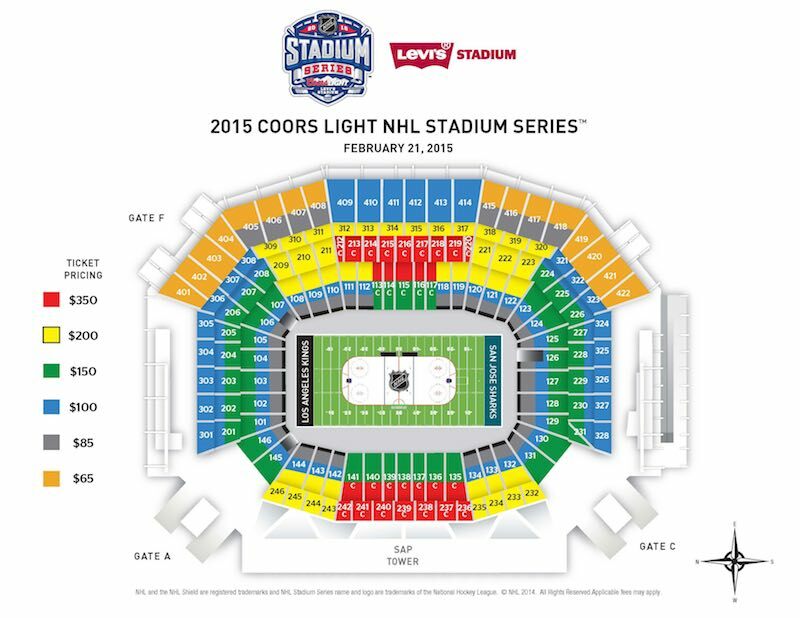 The NHL today announced that Levi’s Stadium has been awarded one of the prime Coors Light NHL Stadium Series games on February 21, 2015. The game will feature the home Sharks and the much reviled, defending champion Kings. When talks initially started about hosting a Bay Area version of the Stadium Series, the question was whether to hold the game at picturesque, touristy AT&T Park or at the newer, much larger Levi’s. In the end, size won out. Hopefully, what will also win out is the desire to curb needless theatrics. The Valley isn’t San Francisco, and it definitely isn’t Los Angeles, though at its worst it aspires to be the latter at times. 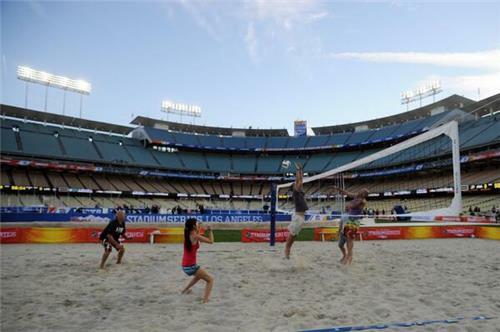 Last year’s game at Dodger Stadium had so peripheral things going on during and before the game (roller skating, beach volleyball) that it was perfectly – and perhaps ironically – emblematic of the California fan experience: easily distracted, ready to move on to something else if the weather’s good. As the discussion was being had locally by the host Sharks, an uprising of support came from the South Bay to hold the game at Levi’s instead of AT&T, because the Sharks are a South Bay team, not just a Bay Area/Northern California representative of the NHL. While it’s unclear how many fans expressed this sentiment, since many of them are longtime season ticket holders, Sharks management had to hear them out and give their voices weight. It also doesn’t hurt that Levi’s Stadium is arguably considered the destination outdoor venue on the West Coast. This time the game will be in a football stadium, which is set up to be congruent with hockey, so there will be less open space to worry about filling as there would be at AT&T. There should be enough casual interest to sell 68,500+ seats, though that will be borne out over time and with published ticket prices. The rich tech population should eat this novelty up just as they have 49ers seat licenses. Another huge sporting event, Wrestlemania 31, is scheduled for March 29. With the announcement, all that’s left is to figure out how to theme it. I shudder to think of the marketing concepts. Nevertheless, I expect to be there with a bunch of friends. How about you? This entry was posted in Hockey, News, San Jose. Bookmark the permalink. I’ll repeat my comment from the other thread: Sorry about that, Larry “Our ballpark would be perfect” Baer. The NHL and the Sharks get it right by snubbing the Giants, their so-called territorial rights to San Jose and their awful-for-hockey baseball configuration. Never mind that ATT Park is 45 miles away while Levi’s can almost be seen from the Sharks regular arena. I’m not sure I’ll be there, but maybe. I kind of plan on avoiding Levi’s Stadium for a bit, until getting there/getting home becomes a little more… ironed out? After my experience last Sat, no. freaking. way. in. satan’s. hell! Score one for SJ. We should not help out the greedy aholes from the north. The traffic mess will be fixed, not tomorrow but it will be ok. This game is not for another six months. Presumably, either the traffic situation will be fixed by then or there will be a formal declaration that the 49ers spent more than $1 billion to put their stadium in the wrong place and the situation can’t be fixed. I’ll probably take VTA Light Rail to this Sharks game but I might want to bring an oxygen cannister with me since it sounds like those trains may being packed to the gills for Levi’s games. I suppose I could have someone just drop me off at the Mercado shopping center and walk the final 15 minutes from there. Excellent move by the Sharks – flipping Baer the bird also. I was wrong, thought that the visuals of AT&T would win out over the $$$$ potential of Levi’s. Whatever, I’ll be there-even if it costs 3.5x as much for inferior seats. ATT is a goofy-looking (and dangerous) ballpark – Levi’s Stadium appears to be a much better venue.